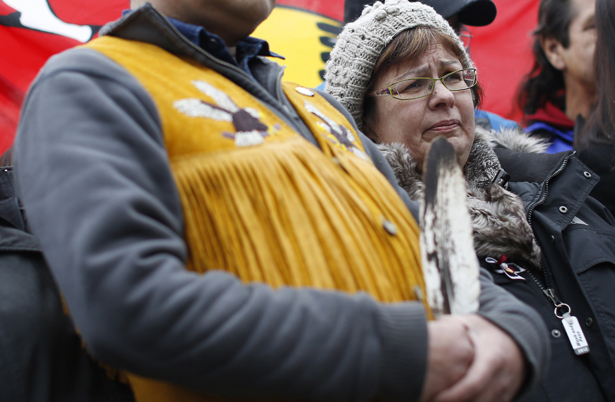 Idle No More has sparked international solidarity. What can that mean for Native rights in the US? Chief Theresa Spence is hungry. The Attawapiskat First Nation leader began a fast twenty-seven days ago to draw public attention to Canada’s Bill C-45. Critics charge that the omnibus legislation will challenge indigenous sovereignty and negatively alter the ways in which land and water are protected. Attawapiskat is in Ontario’s northernmost region. Edging the Hudson Bay, it’s plagued by deep unemployment and woefully inadequate housing. The only real employer is a DeBeers open-pit diamond mine, about an hour’s drive from where most people reside. Attawapiskat is just 600 straight miles from Canada’s Parliament Hill in Ottawa, but because road conditions are so dire you won’t find a map that will instruct you how to get there: it’s so remote, one has to fly in or out of major cities in order to get there. Spence is aligned with the broader Idle No More movement, which has sparked international solidarity for Canada’s First Nations. Started by four Native and non-Native women, the movement began with a teach-in two months ago and has helped people realize the disproportionate ways in which environmental degradation affects Native people. Like Spence, Idle No More is drawing attention to Bill C-45—but in Canada alone, there are currently ten bills that specifically concern First Nations. Internationally, Natives and non-Natives in Asia, Europe and New Zealand have gathered together to create images illustrating mutual support. (I suspect South America may be next, as my Guarani cousin messaged me yesterday to ask about Idle No More.) In the United States, solidarity flash mobs have taken place from New York to Los Angeles and everywhere in between. A massive Round Dance took over a large portion of the Mall of America in Minnesota’s Twin Cities. Inspiring media images of Natives reclaiming public spaces run counter to stereotypes still prevalent in US pop culture—the most recent, perhaps, being the return of what’s called the “screaming savage” image on the Atlanta Braves batting practice caps. Dozens of additional flash mobs are planned in the following weeks, and non-Natives are already considering ways in which they can more clearly manifest their support. But what does this mean? Because of the way populations have been racialized in the United States, we often tend think of Native Americans as another group of people of color. And while many Natives may identify in that way, some others do not. That’s because Natives have a unique connection to the US federal government, which recognizes more than 500 tribes and nations and shares nation-to-nation relationships with them. That recognition allows for a large degree of autonomy and self-determination under treaties and legal schemes for Natives that simply do not apply to other groups. When then-candidate Elizabeth Warren claimed to be Cherokee, many liberals rolled their eyes at the dissatisfaction some Natives expressed. Part of that indignation was due to the fact that Warren perpetuated—and likely unfairly benefited from—the prickly practice of pretending to be someone you’re not. That outrage was well placed when one understands that Natives are citizens of their own nations, and that aside from having their own cultural customs, they also possess their own tribal sovereignty. Until we recognize some of the key differences for those people who inherit rights from the original inhabitants of the land we all live on today, any attempt at solidarity will ring rather hollow. Back in Ottawa, the low today will be 5 degrees. Chief Spence will spend the day in the tipi she set up nearly a month ago, where she has been sipping water, tea and fish broth since she began her fast nearly one month ago, inviting others to join her. She pledged to not end her hunger strike until meeting with Prime Minister Stephen Harper. Other politicians were suggested in his place, but Spence declined, embracing the resolve that she wanted to meet her counterpart. A few days ago, Harper agreed to meet with the Assembly of First Nations, including Spence, on Friday. His announcement preempted a planned press conference by opposition Native leaders. And although some caution that Harper’s only motivation was National Chief of the Assembly of First Nations Shawn Atleo’s call for a meeting, Harper’s decision to meet more quickly than he originally planned signals Spence has his attention—despite the fact he did not so much as mention her during his announcement. A handful of women in Canada have encouraged countless Natives on an entire continent to declare their presence and claim their stakes. The least we can do in the US is listen and learn why. Editor’s Note: This post initially suggested that Stephen Harper agreed to meet exclusively with Theresa Spence. In fact, he agreed to meet with a delegation of First Nation leaders. Spence has announced that she will join that meeting. The text has been clarified.